Another week, another update to my challenges! I have been doing a lot of gold making stuff on my other realms this week, but I have put in a decent amount of work on my characters trying to get my Demon Hunter into Argus Gold missions. I have been stocking a lot of food this week. The other priority has been to work on my Demon Hunter, doing both the Argus questlines and working on finishing the Demon Hunter Order hall campaign. Still haven’t unlocked the gold missions though. 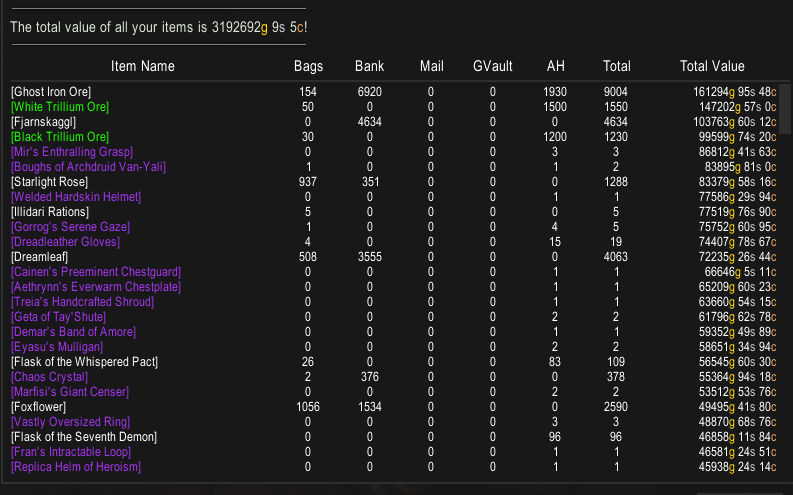 I took a small gold hit when I hit exalted with Argussian Reach as I spent the opportunity buying all of the mounts. As usual BoEs make up a large portion of my sales. 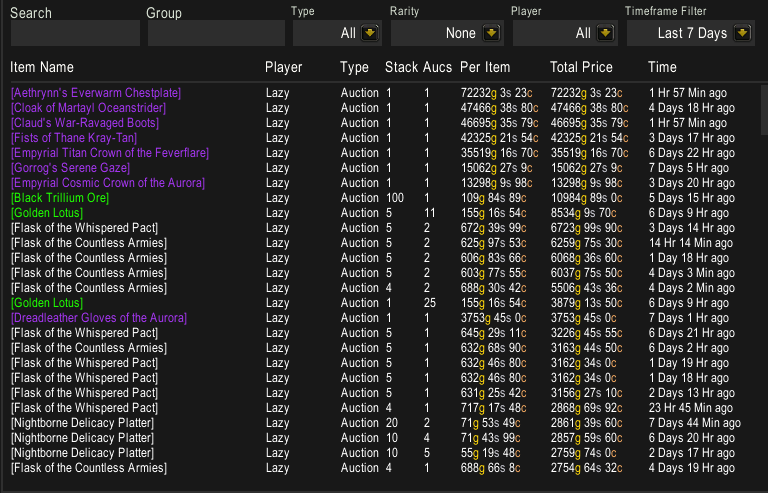 I sold a bunch of Golden Lotuses this week as well, and Trillium has been selling slowly and consistently. The other thing that jumps up is that I am stocking much more food. Nightborne Delicacy platters make an appearance, and they have been selling well alongside the other +375 foods. I’m only missing the rank 3 feast recipes, so that market is likely to be good going forward. We can see that my Gem sales are slightly better than they were last week. 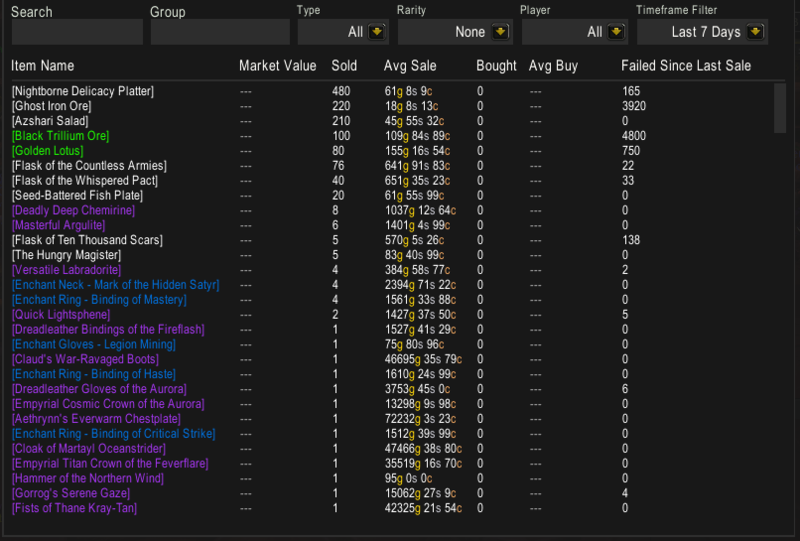 This week they are OK, and my Empyrial and Dreadleather crafted gear is also selling decently. 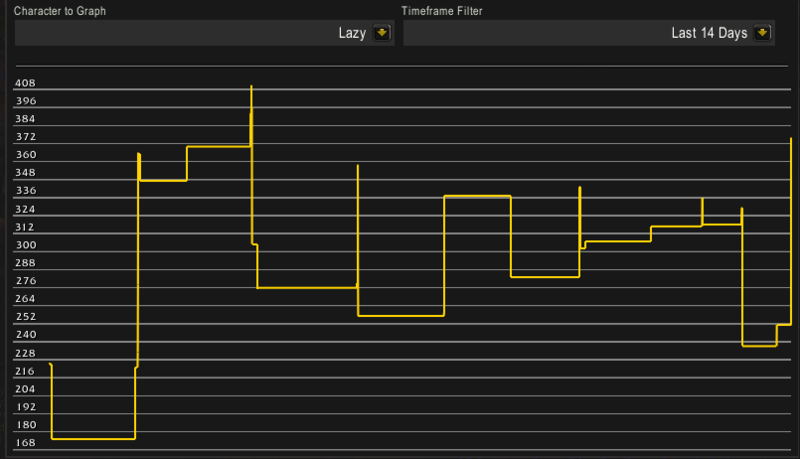 Enchants are doing quite badly, not sure if this is due to my reposting pattern or pricing settings. The last time I checked the profit margin was atrocious, so that might be to blame. I am slowly running out of the MoP materials I bought using Spirits of Harmony so I have to include some more frequent shopping scans for those. Not much to say here this week either. I bought a ton more herbs as they were cheap, but I am likely stocked up for a while now. I have at least 50 of each flask, and materials for quite a few more so I am not in any danger of running out. Hilarious that my Replica Helm of Heroism is still lying around. I might underprice it to get a sniper or flipper to buy it just to free up the inventory space. BoEs are still good, but the deals are a bit farther between than they used to be.